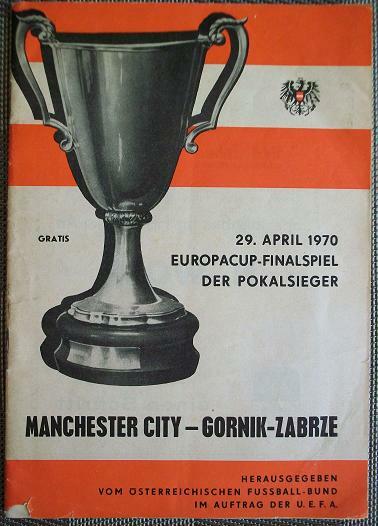 Manchester City started strongly, particularly Francis Lee; The Guardian correspondent wrote “Lee, indefatigable and nigh irresistible continually embarrassed the Górnik defence in the early stages”. Lee had the first chance of the match, a close range shot which was saved by Kostka. Manchester City took the lead in the 12th minute. Lee cut in from the left wing, escaping a tackle from Alfred Olek, and struck a fierce shot. Goalkeeper Hubert Kostka parried the ball, only for it to land at the feet of Neil Young for a simple finish. Shortly after City defender Mike Doyle sustained an ankle injury after colliding with Stefan Florenski.] Manchester City played on with ten men for a period as Doyle received treatment from trainer Dave Ewing, but the defender was unable to continue. Substitute Ian Bowyer replaced him. The change prompted an alteration in formation, in which Colin Bell switched to a deeper position. Shortly before half-time, Young won the ball after loose play from Florenski, which put him clear on goal. As Young moved into the penalty area Kostka rushed out of his goal and upended him, leaving the referee no option but to give a penalty. Lee struck the spot-kick with power into the centre of the goal. Kostka’s legs made contact with the ball, but the force of the shot carried it into the net to make it 2-0. Górnik got a goal back midway through the second half, but there were no more goals and the match finished 2-1. Winning manager Joe Mercer said “the heavy rain in the second half ruined the game” and that he was “quite happy with the performance of our team, although the technical level was rather low in the second half”. Górnik manager Michał Matyas blamed his side’s poor start, saying the “first goal came too early for us and we never recovered from this shock.